A couple of weeks ago, BBC Open Country presenter Helen Mark and producer Steve Peacock visited the Wandle, exploring the river from Morden Hall downstream to Earlsfield. Along the way they met up with many of our friends and partners from the Living Wandle project, including Zoe Colbeck from the National Trust, Tanya Houston from the fisheries arm of the Environment Agency, and Steve Dedman and Bill Skipsey of the Morden Hall Park Angling Club. 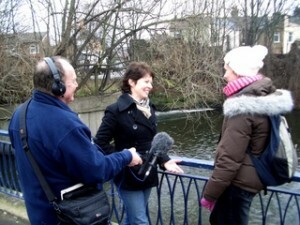 Finally, at Trewint Street, they caught up with Bella and me to talk about river restoration, community cleanups, blown-out safes, and turning South London back to face the Wandle – and you can click here to listen again to the whole programme on BBC Radio 4’s iPlayer for the next month or so! This entry was posted in Uncategorized and tagged Media, People, Wandle on February 1, 2010 by Theo.